Ask fellow campers about "Betsie River Camp Site" and nearby attractions. We really enjoyed this park. It's a good base location to explore Sleeping Bear Dunes. Many of the folks camping there have a boat, and the grassy sites are plenty big for a camper, boat, and vehicle, I didn't see any big rigs, but our 33" motorhome had plenty of room. There's a biking trail that goes right beside the campground. The bathrooms were clean with good showers and good places to put your stuff. The town of Frankfort nearby is a gem! There's a small grill at the campground, but we didn't try it. We camped at Betsie River Camp Site in a Truck Camper. Campsites were adequate, and in a nice setting. Restrooms and showers were clean. Shower water was hot, but there was no hot water at the sinks in the men's room. Electrical outlets in the women's room did not work. We camped at Betsie River Camp Site in a Truck Camper. The location of the park is excellent. It is located next to a bike trail that connects to Frankfort, Elberta and Beulah. Frankfort is a really neat town with unique restaurants, stores and best of all a great beach on Lake Michigan. Our site was on a nice grassy area. The hookups appear old and it was difficult having only 20 amp service. You can't beat the location. We camped at Betsie River Camp Site in a Motorhome. We stayed at this campground during the July 4 holiday. Before going, we tried to find other campers experiences. We found some general ones but nothing with any detail. We gave it a shot and were not impressed. Their web site implies a very friendly atmosphere but that's not what we found. The owners were only friendly when you were spending money in the store. If you saw them around the campground then there was nothing as much as a smile or a simple Hello. We had three campsites and one had to cancel when we were notified the camp ground only had 20 amp electrical service. My 70 year old father needed oxygen at night which required 30 amp connection. The owners would not refund the money even though we gave 3 day cancellation notice and then they rented out the site to other campers for the entire time. We had the pleasure of looking at a campsite that was getting double revenue for the campground. The owners only rationale was "that's what all the campgrounds do". Not much of an effort to ensure return business. Other notes - The dump station is extremely awkward and does not angle your camper correctly. A large share of the sites are cramped and the playground is tiny as the picture on the web site is very deceiving. One credit - The bathrooms were clean. If you go to this area, which is beautiful with lots of fishing opportunities, I would save this campground only as a last resort. We camped at Betsie River Camp Site in a Travel Trailer. 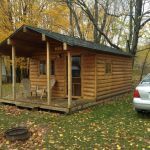 Are you affiliated with Betsie River Camp Site ?